The organ of focus this quarter is the fallopian tube. This is the region closest to the ovary, the name of which is derived from a word meaning “funnel-shaped”. It is a wide opening (just like a funnel, actually), consisting of a thin layer of smooth muscle in its wall, and 20-30 finger-like projections known as fimbriae, which fan out into the pelvic cavity, facing towards the ovary. 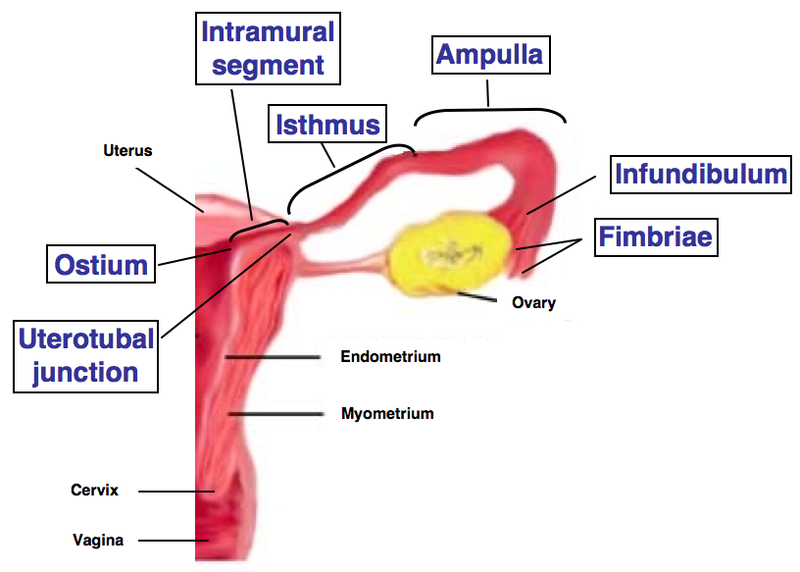 The function of the fimbriae is to coax and drag the ovum from the ovary, into the tube. This open-ended entry point is also known as the peritoneal ostium. One large fimbria (fimbria ovarica) is attached to the ovary in order to keep the two organs close together and prevent the ovum from wandering off into the pelvic cavity. This is the region, adjacent to the infundibulum, where fertilisation occurs. It spans the longest length of the tube (approximately 4-6 cm), contains the widest region of the tube and also its most tortuous. It has a relatively thin wall, which contains two layers of smooth muscle. This region originates at the point where the tube meets the uterus (the uterotubal junction). It is about half the length of the ampulla and, roughly, twice as thick due to its extra layer of smooth muscle in the wall. This is the fallopian tube’s shortest region. It extends from the uterotubal junction, through the thickness of the uterine wall (the myometrium and endometrium), and opens out into the uterine cavity at the uterine ostium. The left and right ostia are quite prominent and so can be viewed hysteroscopically. If you’re interested in seeing what they look like, click here to see an image taken of them during a hysteroscopy examination. A low power H&E of the human fallopian tube. A low power H&E stained section of the human fallopian tube. A medium power H&E stained section of the isthmus region, showing minimal folds in the mucosa. There are two types of simple columnar epithelium in the fallopian tube, too; these are ciliated and non-ciliated epithelium. A high power H&E stained section showing the two types of simple columnar epithelium in the human fallopian tube. Cilia are microscopic hair-like structures that act like tiny oars, beating backwards and forwards along the length of the tube. The size of the cilia varies depending on levels of circulating oestrogen. Around the time of ovulation, high oestrogen levels cause the cilia to reach their maximum size. These high levels also stimulate their activity, thus increasing their “beat”. The combination of these effects achieve optimal propulsion of the ovum towards the uterus. 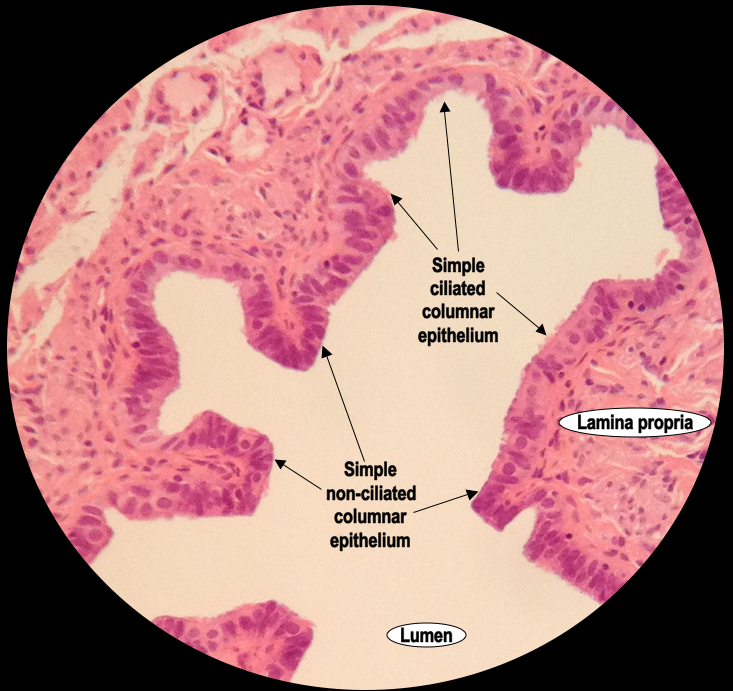 Ciliated columnar epithelium is most abundant at the ampulla, where it is needed most to prevent the ovum from entering the pelvic cavity. During the last stage of the menstrual cycle (particularly luteolysis), when the progesterone levels are high, the cilia remain redundant and so degenerate. Also known as “peg cells“, these are secretory cells whose function is to provide nutrients to the egg as it migrates through the tube. They don’t contain any cilia, but they do have microvilli, which are like tiny folds in the cell membrane, very much like the mucosal folds we saw earlier but on a much more microscopic level as the folds are on the individual cells rather than a mucosal lining. Similar to cilia, these microvilli also lengthen when stimulated by oestrogen and shorten when progesterone levels rise. 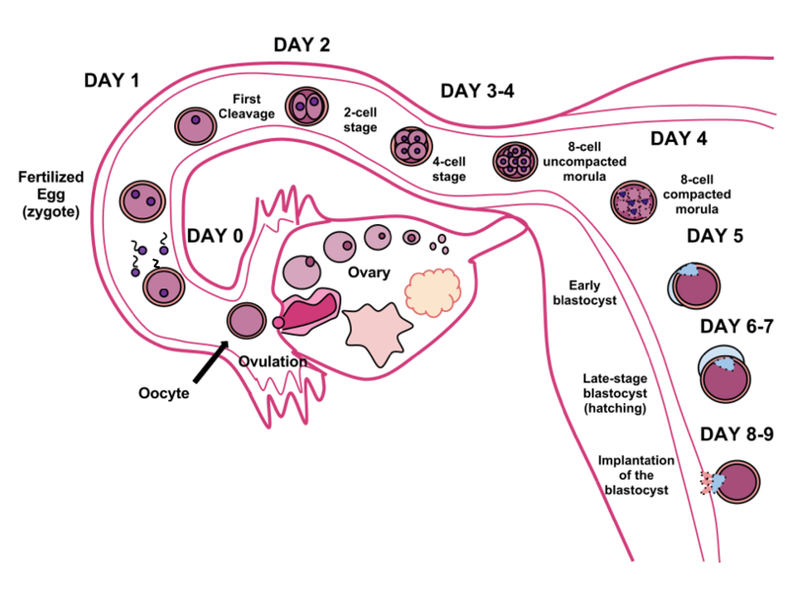 The secretory activity of these cells are also stimulated by oestrogens, making it very timely for ovum migration, too. 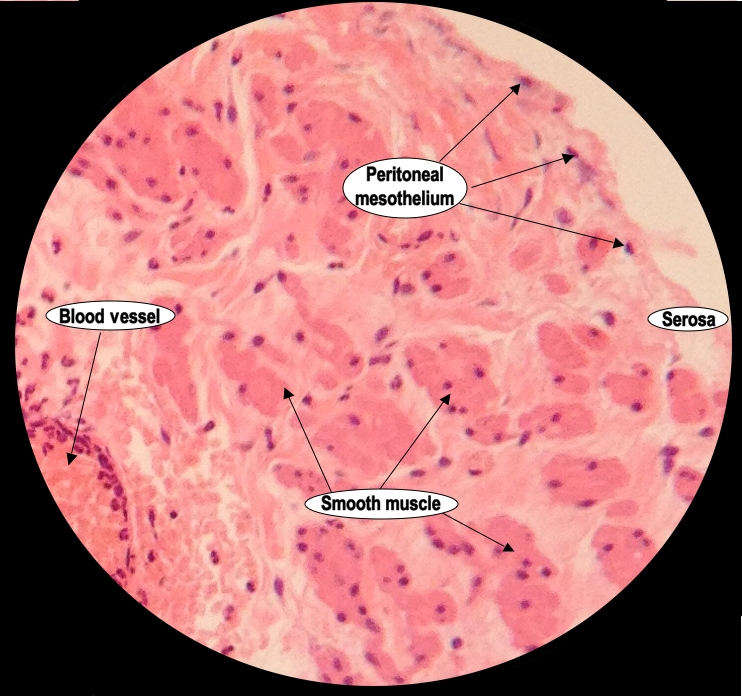 This type of epithelium is more prominent at the isthmus. This layer is directly below the mucosa and is made up of connective tissue and a large number of blood vessels (see previous images). The muscle fibres within the muscularis show two different patterns in the same tissue section, and this is because some muscle fibres are arranged so they lay along the length of the lumen, whereas other fibres wrap around it. Those that are along the length of the lumen are known as longitudinal muscle fibres, and when these contract they shorten the length of the tube. Those that wrap around the lumen are called circular muscle fibres, and when these contract they cause the lumen to become narrower. 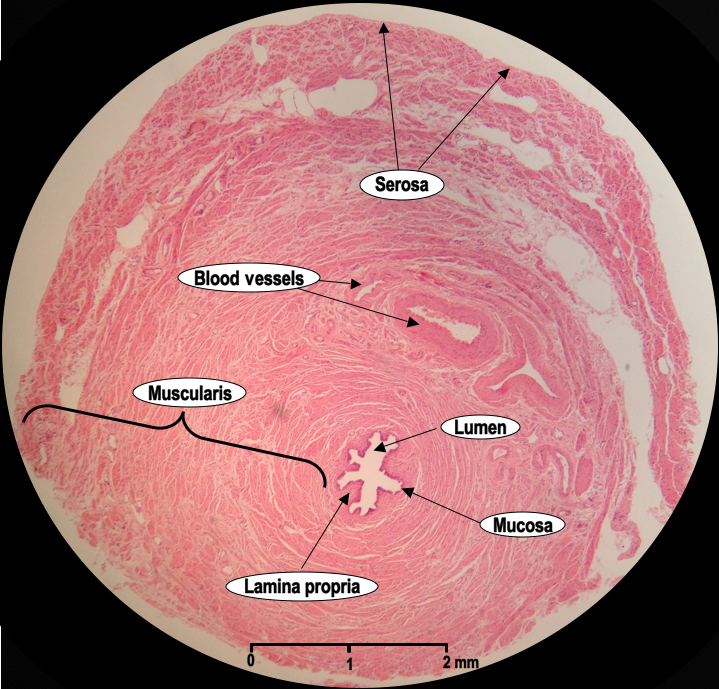 If we take a look back at a higher power photomicrograph of the first image we saw, you can see distinct patterns of the smooth muscle, with the uniform circular pattern of the circular muscle fibres wrapping around the lumen, appearing far more prominent than the dotty and sporadic pattern of longitudinal muscle fibres. A low power H&E stained section showing the patterns formed by longitudinal and circular muscle fibres. 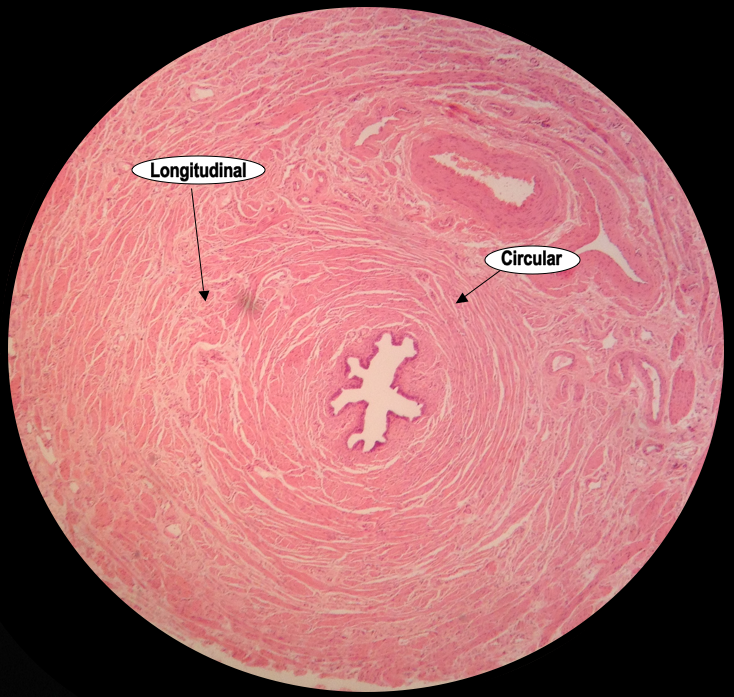 The infundibulum contains just one layer of longitundinal smooth muscle. The ampulla contains two layers; one longitudinal layer and one circular layer. 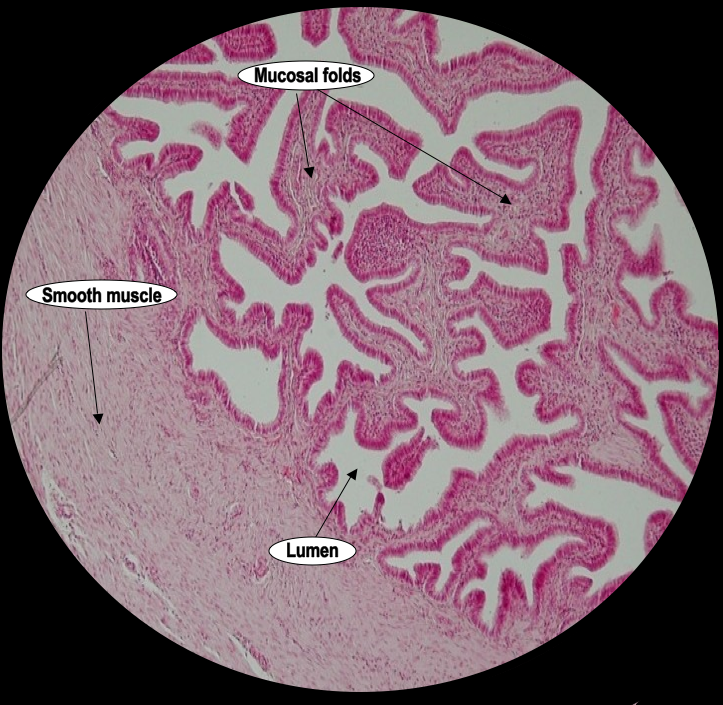 The isthmus has a much thicker wall than the rest of the fallopian tube, and this is owing to the three layers of longitudinal and circular smooth muscle in its wall. The function of these muscle layers, much like the muscles in our food pipe that move our food along, are to contract in coordination so that the ovum can be propelled towards the uterus. This process is also complemented by the ciliary activity of the columnar epithelium, which we saw earlier. The complex coordination of the contractions are also put to use in the opposite direction, when the time is right, to assist the sperm in reaching the ovum. This is the outermost layer of the tube, which contains a lot of large blood vessels. It is also covered by a single layer of peritoneal mesothelium, which is a covering of the abdominal cavity lining (the peritoneum). The peritoneal mesothelial cells can be found along the very edge of the fallopian tube appearing only occasionally in the section with a seemingly flattened shape. A high power H&E stained section of the serosal surface showing the flattened appearance of peritoneal mesothelial cells. All images are Copyright © 2013 Della Thomas, unless otherwise stated. Hi Della, Great post. I’m a histology lecturer and can I please just add a word of caution – lamina propria and submcuosa are two different layers. 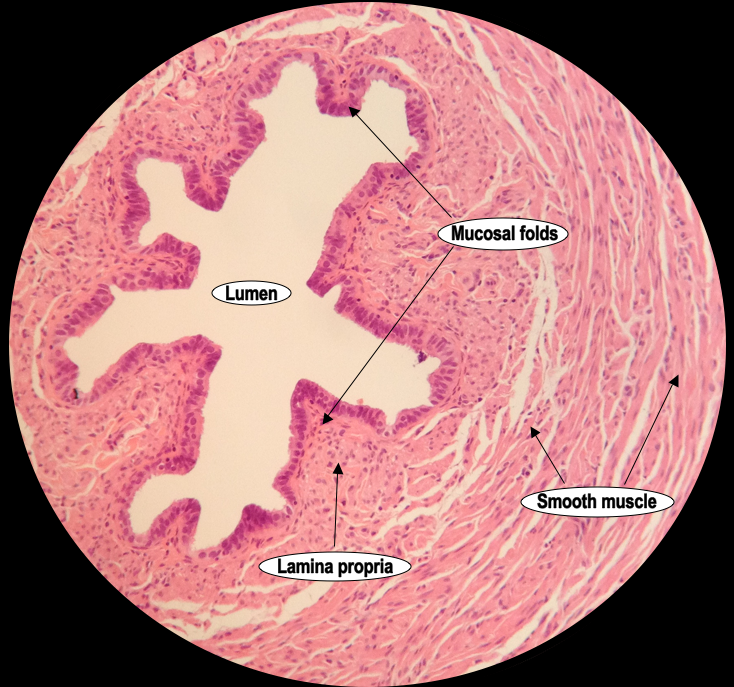 Histologically, we recognise 3 layers to the uterine tube – mucosa (epithelium and lamina propria), muscularis and serosa. It’s a very minor detail but in a histology-specific exam, a student would be marked incorrect (at least in my unit) if they wrote the uterine tube had a submucosa. I love your enthusiasm for histology – keep it up! Thank you so much for correcting me. I just looked back at my hand written notes for this blogpost and I can see where my confusion came from. Thank you so much for picking me up on this, it is all much clearer for me now. I will amend my blogpost’s content and images. Please do feel free to correct me on any of my other blogposts. I use blogging as part of my study and although I try very hard to, I may not always be 100% correct, so I really do welcome any feedback.